Okay, it’s been a long time since I’ve even been on this site so once again I need to apologize for not responding to comments or keeping our readers in the know about what’s going on with the Appalachian Journey series. My only excuse is that MS and hot weather don’t play well together and this summer has been extremely hot here in the mountains of North Carolina. It’s finally cooling off some and the MS is calming down–thank goodness!–and we have some major news. You’ll notice there’s no blurb on the back. That’s on us, not Kim because we haven’t sent her one yet. The picture on the front is the one of Aunt Bessie and our dad standing in a field of wildflowers and it’s resting on top of Aunt Bessie’s photo album. The beautiful asters and clover beside the album were picked by yours truly and Kim on a pretty summer day–before this blasted heat set in. The painting on back is by our dad, of course, and shows Stone Mountain Baptist Church as it looked when he was living on the mountain with Aunt Bessie and Uncle Fletch. Isn’t it gorgeous? Christy and I think it’s the best one yet! What do you think? Love the cover and can’t wait to read your new book. The cover is wonderful! It’s artsy and natural at the same time.The flowers look beautiful with the old album.Love it!Can’t wait! Thanks, Pam! “Artsy and natural” – I like that! Love the new cover! Didn’t know you had MS. I’m sure that complicates your life. May the Lord bless and take care of you. Looking forward to the release of Wise Woman. Keep posting! Thanks, Kathy! The way I look at it, there are a lot worse things than MS but thanks for the blessings, too! I love these books and couldn’t put them down. I hope there are more to come. So glad to hear you liked the books, Cheryl. 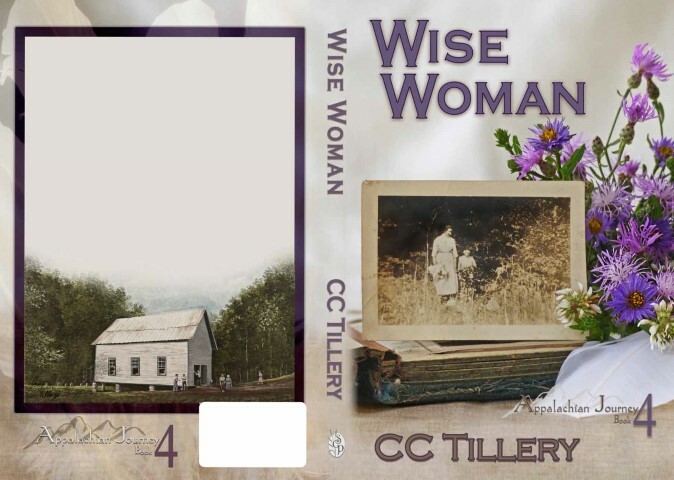 We’re hoping to release Wise Woman later this year so there will be at least one more in the series. We haven’t let ourselves think beyond that yet!. Thanks so much, Gwen! We think so, too! I love the artwork and really appreciate you continuing to honor your Dad’s art – which, to me, acquires even greater meaning by honoring it within your own. I have gathered the fortitude to patiently wait for the December release with the hope that we will be rewarded with many, many pages (I could easily handle 1000 :-)) and countless stories of Bessie, Fletcher and, of course, Dad. Thanks so much, Paige! These books could not be written without Daddy and we’ve always been in awe of his beautiful paintings so it just seemed natural to include them with the books. 1000 pages? Yikes! I’d better get back to it! I think this is one of my favorite covers too. That may be in part because I enjoyed having a partner in crime looking for the flowers and feathers. This one also has been thought about for awhile giving plenty of time for ideas to form. Then toss in you both being great to work for! Laughing at “partner in crime”! I enjoyed it, too! And I’m looking forward to the next time–if we can ever get our schedules to mesh again! You did such a wonderful job on all of the covers but Christy and I think you topped yourself on this one! There are no words to tell you how much we love it or how much we appreciate you and your talent! The cover is absolutely beautiful and projects a wonderful period in history. Congratulations to you and your designer. Well done! Thanks so much, Betty! Kim did an outstanding job. We’re in awe of her talent and creativity! I have soooo enjoyed these books and am looking soooo forward to your new release. Thank you so much for giving us so much enjoyment!!! Thanks, mslinjwin! We love that you enjoyed the books and thank you for putting smiles on our faces with your comment! blessings available to us, your readers. For that I thank you. What a lovely comment, Mary! You’re very welcome and thank you! We’ve said it so many times because it’s true: we have the best readers in the world! I love reading historical fiction, but you two have turned the genre into historical fictional reality! Thank you for sharing your family stories,. I hope to be reading book by my birthday, December 31st! Happy writing, now that the weather is cooler. Thank you for sharing your family stories. My favorite genre is historical fiction, but you two have added the word reality. Historical fictional reality is a new genre! I hope to be reading book #4 by my birthday, December 31st. Hi skipper12, and you’re welcome. We’ll do our best to make your birthday wish come true! Thanks for the lovely comment–love the new genre name!